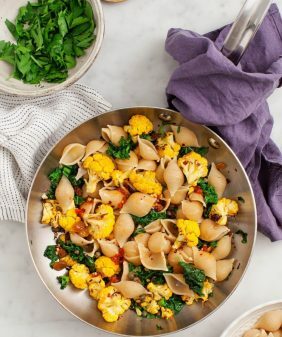 The secret to this vegan pasta bake is a velvety, savory almond-miso sauce that creates a creamy coating for the veggies and pasta. Happy first week of spring! With summer on the horizon, at least in my still-Austin-based mindset, I really want to be making lighter and brighter food. But then I’m reminded that it still snowed here last week. Sooooo… a creamy pasta bake it is! 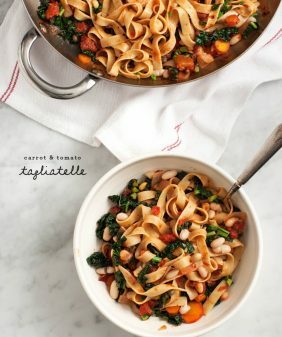 This veggie-ful dish is hearty yet cheese-less – it won’t weigh you down, but it will fill you up! Instead of a bunch of cheese and cream, I used my secret creamy blender sauce: almonds, Almond Breeze almondmilk, white miso paste, garlic, lemon juice for tang, and a bit of Dijon mustard for the depth you want in a pasta bake. 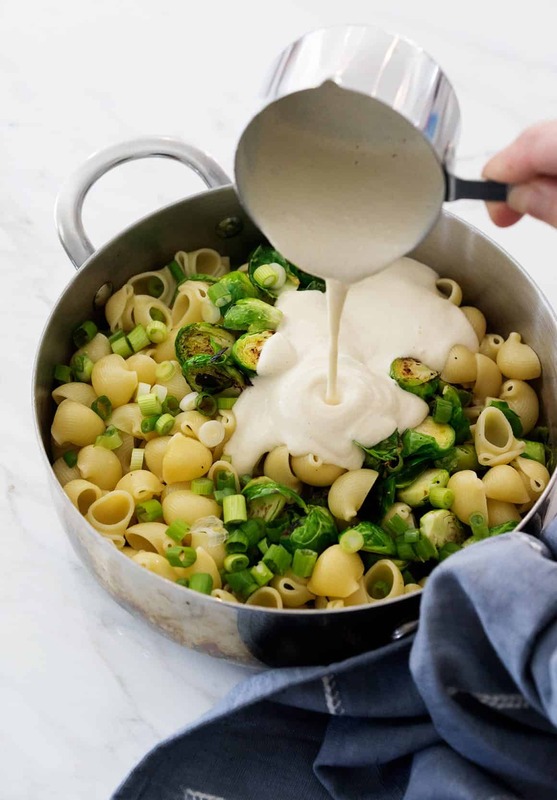 Yes, if you’re a super fan, you may recognize many of these ingredients from the creamy miso pasta recipe in our cookbook… it’s a wonderful combo that I’ve adapted here to make a cozy baked version. 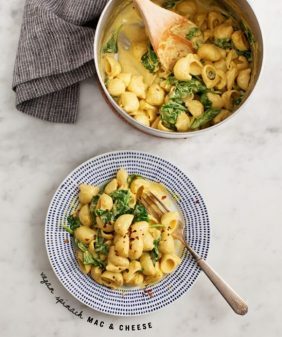 A quick note: I usually keep AlmondBreeze Unsweetened in my fridge at all times, so that’s what I used in this recipe, but their Almond Cashew blend would be deliciously nutty and creamy in this sauce as well. Once the sauce is made, set it aside and cook your Brussels sprouts. Since the sauce doesn’t contain cream or cheese, it has to have a short bake time so that the sauce stays creamy in the oven. This is why I precook the Brussels sprouts – plus they’re always better with a little sear to bring out their flavor. After the Brussels sprouts are decently browned, combine with the pasta and pour on the sauce. It will seem like a lot of sauce, but we want a creamy pasta bake, so sauce it up! 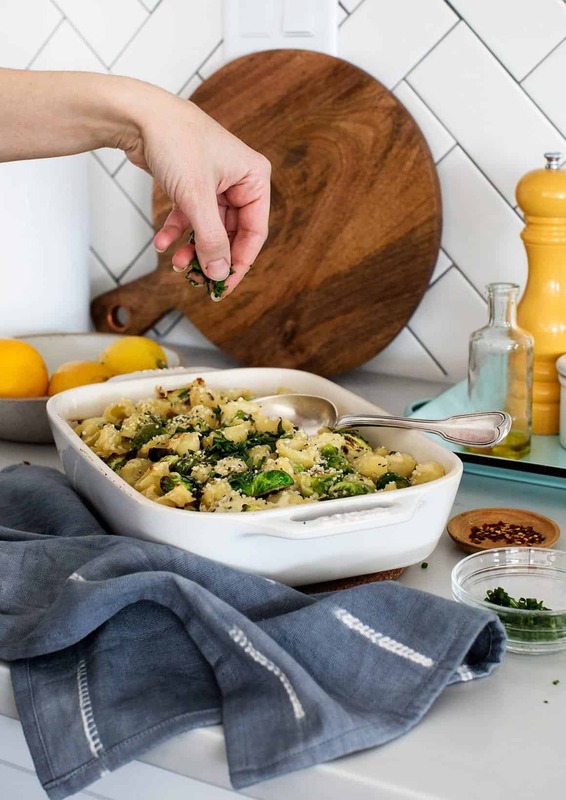 Once you have everything in the baking dish, you could technically top this pasta bake with a cup of melty mozzarella cheese or a healthy shaving of fresh Parmesan cheese. If you live with picky eaters you may want to go that route. If you’re like me, you’ll top it with a sprinkle of hemp seeds, panko bread crumbs, and a generous drizzle of olive oil. Bake, then top with chives and/or tarragon. 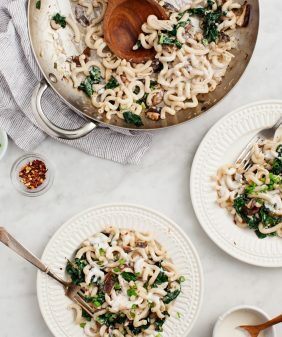 Love creamy vegan pasta as much as I do? Try these shells with broccoli or this pumpkin penne. This creamy vegan pasta bake is a cozy, healthy dinner that's easy enough for a weeknight. Follow the recipe as written for a vegan meal, or, if you're not vegan, top with a little mozzarella cheese! Preheat the oven to 400°F and brush a 7x9-inch or similar size baking dish with olive oil. Make the white miso sauce: In a high speed blender, combine the almonds, miso paste, garlic, Dijon mustard, almond milk, lemon juice, olive oil, and salt and blend until smooth. Make the pasta: Bring a large pot of salted water to a boil. Prepare the pasta according to the instructions on the package, cooking until al dente. Drain and toss with a little olive oil to keep the pasta from sticking together. Heat the 1 tablespoon olive oil in a medium skillet over medium/high heat. Add the Brussels sprouts and cook, stirring occasionally, until browned and tender, 6 to 8 minutes. Remove from the heat, add the wine, and stir to scrape up any bits that have stuck to the bottom of the pan. Add the cooked pasta, the scallions, and the miso sauce to the pan. Stir to coat, then transfer to the baking dish. Top with the panko bread crumbs, hemp seeds, a few pinches of salt, cheese, if using, and drizzle the top with olive oil. Bake, covered for 15 minutes or until the Brussels sprouts are fully tender and the dish is just warmed through. This short cooking time will prevent the filling from drying out. Remove from the oven, sprinkle with the fresh herbs, and serve. Note: if you're not vegan and want to bake this with cheese on top, sprinkle 1½ cups shredded mozzarella cheese and bake uncovered until bubbly, 20 to 25 minutes. This post is sponsored by Blue Diamond Almond Breeze almondmilk. Thank you for supporting the sponsors that keep us cooking! Can’t wait to try the recipe! Hi! 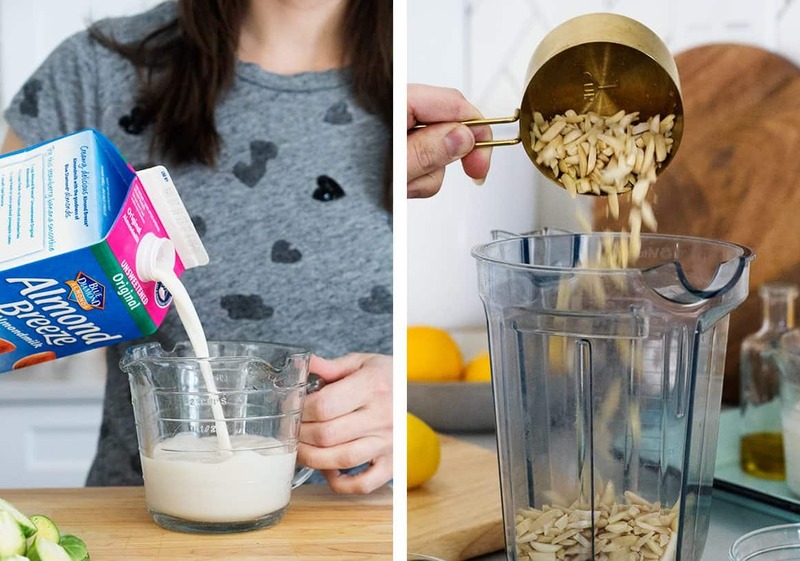 What can I use in place of the almonds /almond milk? I have a tree-nut allergy. So yummy looking! Going to go for all veggies and use zoodles. Thanks for the inspiration. Some days I have the most intense craving for pasta. This recipe provides a way for me to indulge without feeling too guilty. The pasta is so saucy and yummy!! The good thing about it is that it is so healthy as well! I would love to have it for dinner tonight that is if I can find all the ingredients first! Hi!! I am such a fan of your esthetic and recipes! Do you have go-to suggestions for nut substitutes? I am lactose intolerant and my husband is allergic to nuts. 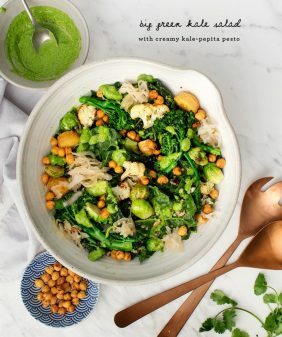 Finding good “creamy” vegan recipes has been so hard because of this issue! I used coconut milk (non-canned) and 1.5 tbs of AP flour to thicken instead of the almond milk and almonds. Kept everything else the same and it worked out really well for me! Made this last night… it was amazing! I only had 1 tbsp of white miso, so I substituted 1 tbsp of nutritional yeast for the second tbsp. My family loved it! Thank you for this blog, I have made many of your recipes and they are all a hit in our house! I have shared your site with many friends over the years, and even given your cookbook as gifts to family members… thank you for all you do! I made this for dinner tonight and it was absolutely amazing! I will definitely make again! Loved the recipe! Will definitely make again. – If adding parmesan cheese on top, forgo the salt on top too. It can make it too salty. Other than that a creamy delight! This looks so good! Definetly going to try and make this this weekend! Yum! 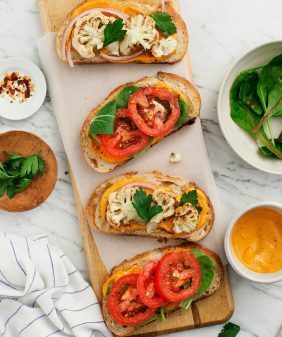 This looks amazing and super easy to make! Really excited to make this for my family this week. My store didn’t have slivered almonds, wondering if I can just use whole almonds and chop/sliver them myself to get the correct measurement? You could try that, the nice thing about slivered almonds is that they’re blanched and peeled, which makes the sauce smoother than using almonds with skins. If you had cashews, that would be my second choice. Or if you’re using a Vitamix blender or similar, the almonds should be fine. If not, another option is to boil the almonds ahead of time for a few minutes to help them blend smoothly. I hope one of those choices helps! This dish is all the things I’ve been craving since going vegan. It’s definitely going to be my new go-to Mac & Cheese recipe! I used GF macaroni and it was perfect. I would definitely use cherry tomatoes next time though; I just didn’t love the sprouts. Hi Caitlin, I’m so goad you loved the sauce! Awesome. May I ask what type brand name you use for pots and pans . Thanks. Hi Allison, I have the Williams Sonoma Open Kitchen set, I’ve had it for years, it’s great!